The goal for Markdown's formatting syntax is to be as readable as possible. A Markdown-formatted document should be publishable as-is, as plain text, without looking like it's been marked up with tags or formatting instructions. Markdown is used by popular websites like Reddit, GitHub, and Stack Overflow. Instantly see what your Markdown documents look like in HTML as you create them. While you type, LivePreview will automatically scroll to the current location you're editing. Markdown formatting can be applied (and removed) with handy keyboard shortcuts and toolbar buttons. You don't need to know anything about Markdown to use MarkdownPad! 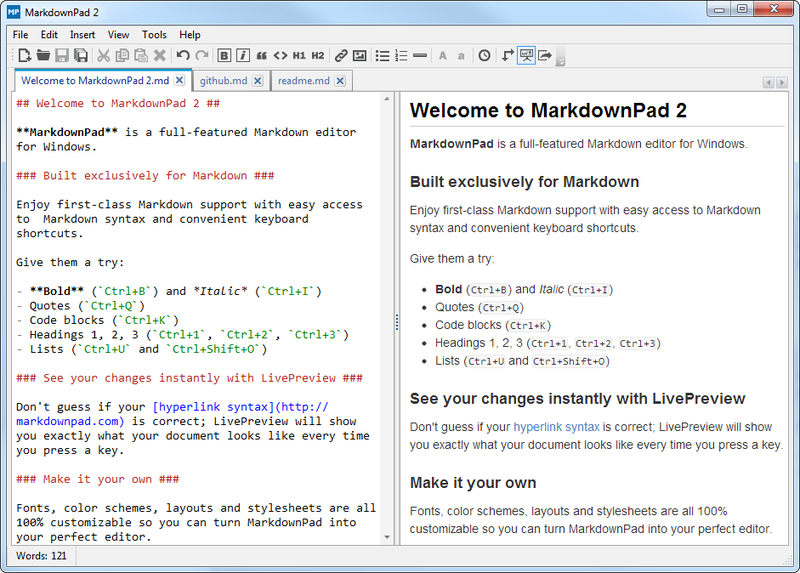 Color schemes, fonts, sizes and layouts are all customizable so you can turn MarkdownPad into your perfect editor. Change the look of your HTML documents by using your own CSS stylesheets. 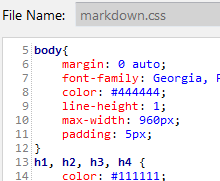 MarkdownPad supports multiple stylesheets and has a built-in CSS editor. 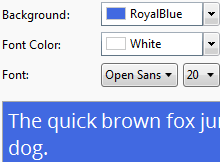 The default CSS is beautiful and minimal, and will make your HTML documents look great. 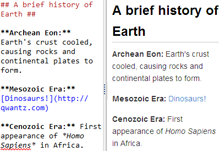 Quickly create ready-to-use HTML documents, or simply copy a portion of your document as HTML. Need a PDF? 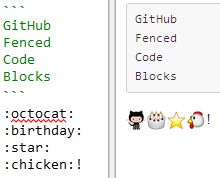 No problem, you can create them directly from MarkdownPad. MarkdownPad Pro supports multiple Markdown processing engines, including Markdown Extra (with Table support), and GitHub Flavored Markdown. With tabbed documents, a built-in image uploader, spell check, auto-save and syntax highlighting, there's no limit to what you can do with MarkdownPad. MarkdownPad for Windows is stunning. Simple. Clean. Perfect. Well done, @evanw. MarkdownPad is what I do pretty much all of my writing in. It's a great little app. If you have any interest in Markdown, and you're a Windows user, MarkdownPad is definitely worth a download. 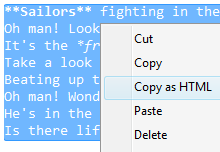 I just discovered MarkdownPad for Windows so, uhh, I guess this is goodbye, Microsoft Word? MarkdownPad destroys the myth that Markdown editors only exist on Apple's Mac OS X.
MarkdownPad saved my life writing API documentation for work. Best software I've used in a long time. 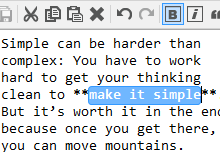 I love MarkdownPad, it's my first stop when writing almost anything. Great that the developer, @evanw, is so responsive too! We're able to write our Markdown documentation on Windows with ease thanks to MarkdownPad. Want to share your love for MarkdownPad? Use the hashtag #MarkdownPad on Twitter! Evan Wondrasek, a software engineer based out of Minneapolis, MN. For updates, follow @evanw on Twitter. MarkdownPad is designed for Windows and uses the .NET 4 and Windows Presentation Foundation 4 frameworks (that means it's extra shiny on the inside). Unlock the full potential of MarkdownPad by upgrading to MarkdownPad Pro. This version includes great additional features and is licensed for commercial use.